He's never been an artist who's given the impression of playing the game or of grasping for fame, but there's been something of an air of returning to the big(gish) time for Kenny Anderson recently. 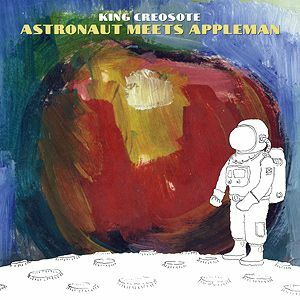 A cult hero as King Creosote around the East Neuk of Fife and eventually across Scotland since the late 1990s, he finally hit the wider public consciousness with 2011's Mercury Prize-nominated Diamond Mine, a perfect distillation of his delicate, wistful, perfectly Fife muse, produced in collaboration with Jon Hopkins. The immediate aftermath of this burst of success, however, saw him seem to recoil from the strictures of mainstream fame; efforts to record a Diamond Mine follow-up were resisted, and his next success was of the slow-burn sort, with 2014's soundtrack to the film From Scotland With Love taking longer to let its sometimes astonishing quality sink into the bones of listeners. Amid the usual plethora of recordings on his own label Fence, then, this return once more to Domino feels like some kind of conscious comeback, a follow-up of sorts to the last half-decade's two sizeable critical successes. Once more, it's a great album, yet there's a greater sense of wistful reserve to Astronaut Meets Appleman than either Diamond Mine or From Scotland With Love bore. In recent years, Anderson has become a father again (his own child provides the looping, hypnotic title lyrics of 'Peter Rabbit Tea'), and the confusing blend of optimism, fatigue, romance and resignation which accompanies that state is evident here. The opening 'You Just Want' moves to a glacial rhythm, a breathy female vocal part and eventually a gorgeous harp in the background; 'Melin Wynt' opens on an extended bagpipe note, with Anderson dreamily realising 'with my track record jaws will hit the floor / but all that has to change'; 'Love Life' is perhaps cheeriest of all, but still resigned, in this case to not getting any: 'all my chemicals cry out with desire,' he sings, 'Scarlet Johansson was never in my house.' He dreams of escape to where 'life is a whole lot safer underground' on the buzzing, imploring 'Surface', but once again his urge to come up for air and put it all out there is heaven for the listener. Out on Fri 2 Sep on Domino Records. Eclectic indie folk musician, plaintive troubadour and founder of the esteemed Fence Records.